Perhaps even the custom. | Scuffalong: Genealogy. Perhaps even the custom. – Scuffalong: Genealogy. 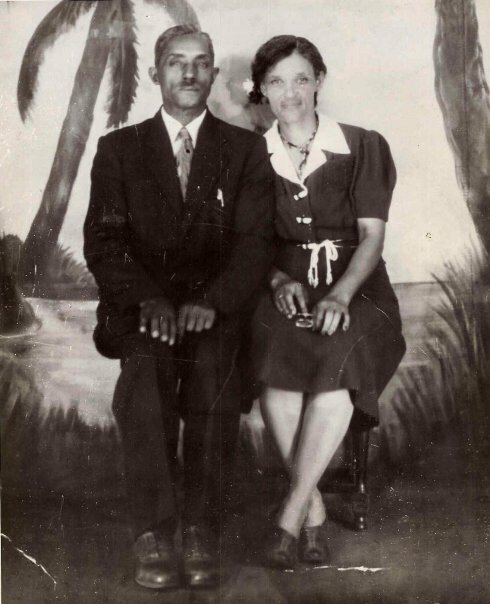 A Social Note: Miss Florence [sic: should read “Frances”] Ann Henderson married her first cousin, Israel H. Wynn. This relationship was very common in her youth, perhaps even the custom, she believes. Rev. R.B. Johns officiated at her marriage on December 12, 1908 in her parents’ home. Many friends and relatives attended including Val Simmons, Milford and Freddie Carter, Mrs. Eva Kornegay, and Mrs. Tina Hagans. In fact, there were so many guests that the floor of the house gave way under the weight of the people. — from the souvenir booklet commemorating the 100th anniversary of the First Congregational Church, United States of Christ, Dudley NC, 1870-1970. Frances Ann “Frankie” Henderson was the daughter of John H. and Sarah Simmons Henderson. Israel Henderson Wynn was the son of John’s sister Hepsie Henderson and her husband, Washington F. “Frank” Wynn. Marriages among descendants of Wayne County’s free families of color were certainly the custom in the 50 years or so after the Civil War, and cousin marriages (if not first cousin) were concomitantly common. Copy of photograph in possession of Lisa Y. Henderson. → How we went North. ← Mildred Wardenur Houser Jones.